Scalloped Shrimp and Potatoes recipe originally published in Simple and Delicious, December/January 2011. Onion Crescent Rolls recipe originally published in Taste of Home, Holiday Collection 2008. When I saw the picture of the Scalloped Shrimp and Potatoes it was being served with sesame seed breadsticks. I immediately began to scan my recipes for something similar – which I eventually found – but I could not stop my brain from wanting to make these Onion Crescent Rolls. I looked at the shrimp recipe a little closer and realized that they would work well since there wouldn’t be much competing spice in the cheesy shrimp and potatoes. My only regret is that it doesn't have a lot of color to the dish. The crescent roll kind of blends into the shrimp and potatoes. Of course, that has nothing to do with taste or texture. I just like my food to be pretty as well. Recipe originally published in Taste of Home, Holiday Collection 2008. There are two things I’ve never enjoyed eating – pineapple and coconut. This posed quite the issue when we moved to Hawaii, so I had to branch out a little. I still can’t stand pineapple, but I grew to enjoy coconut a little. One thing I DO like, is butterscotch, so when I stumbled upon this recipe, I figured it was worth a try. Not bad, right? My tasty little morsels stacked up quite nicely against those of Taste of Home. I do have one complaint. The recipe said that you are supposed to get 78 1-inch square pieces. Now, I’ll do the math a little later, but I have to ask you – do those look like 1” squares to you? I don’t think so. In fact, MY squares are not 1” and they look much smaller than theirs. Recipe modified by You Want Me to Cook? on February, 6, 2011. Recipe originally published in Every Day with Rachael Ray, October 2008. Every time I eat a mozzarella stick, I wonder how it was made. Cheese melts in heat and super hot oil has a lot of heat. So I was really interested in making this dish, if not for anything but the experience of making cheese sticks without melting them in the pan. Aw, who am I kidding – I LOVE CHEESE STICKS!!! What I wasn’t expecting, was loving the salad that came with the recipe more than the cheese steaks themselves. Maybe I’m crazy (and definitely biased) but if I was offered these two plates and told to choose, I’d pick mine. My cheese steaks look thicker and have a perfect golden crust. Also, my salad doesn’t look like it’s been wilted. I was super excited to get to try these, but I had to wait until I finished my Fontina, Caramelized-Onion and Pancetta Pizzas for our Super Bowl Fiesta. I’m glad I made them save at least one steak and some salad for me. Recipe modified by You Want Me to Cook? on February 6, 2011. Recipe originally published by Cooking Light daily e-zine on Thursday, March 5, 2009. I’ve always loved pizza. My mother used to make her own pizza dough and pizza sauce from scratch. She had special bricks and pans that she used to cook them. In fact, we had this large antique oven in the basement just for cooking pizzas (it may still be there for all I know). Sad to say, I was only ever in charge of stirring the sauce and chopping some of the toppings. To this day, I still have no idea how she makes her pizza dough. This recipe was one of those dishes that sounded absolutely delicious, but every time I read through the ingredient listing and directions, I would say, “yum, but not this week… too much going on.” After having dinner with my uncle and aunt who made us the most delicious pizza with their own homemade pizza dough, I was inspired. I pulled this out and decided this would be my pièce de résistance of our Super Bowl Sunday meal. Besides, if I was going to put a lot of effort into a dish, why not do it for guests? I did have the phone number of our favorite pizza joint out, just in case. By the way, it is a three-smoke-alarm recipe. Yeah, I needed to ventilate the kitchen when I was done. My pizza didn’t seem to be as piled high with “stuff”. My crust definitely looks crispier and more golden – a trait that is a requirement for my pizza. Overall, I wouldn’t turn away either pizza, and I was eager to try it. 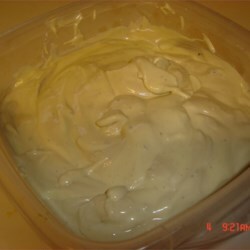 Recipe originally published by Allrecipes daily e-zine on Friday, July 18, 2008. I rarely can justify making dips. All that is going to happen is that I’ll eat dip and chips for a meal one night; therefore, the small “intelligent part” of my brain says that this would be a bad idea. However, this day was Super Bowl Sunday, and for the first time in a long time, we were having company. I lined up a long list of things I had been waiting to try, hoping at least half would come out good enough to eat. None of the reader-uploaded pictures were very good. This one was the clearest I could find. Obviously, I didn’t want to take a picture of just a big tub of dip, so I scooped out some to show the thickness of the dip. For the most part, they look pretty similar although mine does look a little chunkier. These recipes had been on my mind for awhile. First, the egg scramble had sounded delicious, but I didn’t want to make a breakfast dish that served 10 people. Problem solved when I read the recipe in more detail and saw that you have to make it half at a time. Bravo! Then there is the bacon. As much as I’d like to eat an entire pound of bacon for breakfast, the intelligent part of my brain tells me that isn’t a good idea. I like to listen to that part of the brain every now and again. So one day, I decided to make these two together. Now don’t think it went completely smooth. Nope, I had issues, but nothing too horrible that I wouldn’t make both or either again. Egg Scramble recipe originally published in Taste of Home, November 2007. My eggs look slightly drier than theirs did, most likely because I had to wait for my bacon to be done to eat. The look of the picture aside, I had light and creamy eggs and good vegetable distribution throughout the dish. Will they pair well with the bacon? Let’s see! 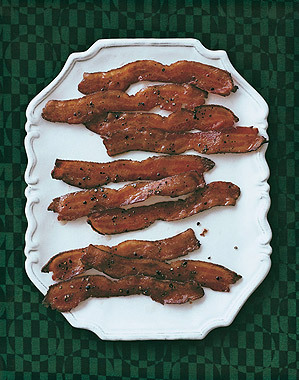 Maple and Black-Pepper Bacon recipe only. Maple and Black-Pepper Bacon recipe originally published in Gourmet, December 2008. Bacon makes everything better. This recipe was challenging, but as you can see, I must have done something right. It turned out crisp, sweet, salty and spicy… oh, and gorgeous. For a commentary-free and printer friendly version, please click here. Recipe originally published in Cooking Light’s weekly e-zine on Friday, January 30, 2009. I am a sucker for all things retro, so the title caught my eye. 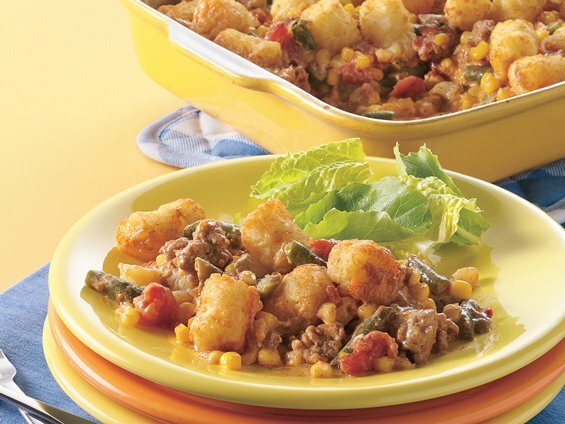 The premise of this recipe is a tart chicken casserole with a crunchy topping. I was sold. Cooking Light also took the time to “thin it out” a little, so I didn’t have to deal with all the pesky fat and calories that usually comes with a recipe like this. Unfortunately, Cooking Light didn’t take a picture of their dish as a serving (although their picture does look awfully pretty). However, comparing the two, my chips are golden and you can see the lovely green and red of the vegetables poking through. So I passed the visual test, now I had to worry about taste. Taste of Home has “field editors” which are basically people like me who write recipes, send them in, and then get paid a small amount for their submissions. I guess they can also claim they’re “published” but that’s neither here nor there. When you read their e-zines or magazine, usually the chef will write a little blurb, either about who likes it, why they came up with it, how it is a family tradition, etc… So this recipe’s blurb was about how the baker and her husband are trying to eat lighter but still wanted sweet treats to enjoy now and again. That’s sounds like me, so I decided it was time to give this one a try. I made my cake in a different size pan (I’ll explain in detail later) so not only is it a little thicker, the frosting is also thicker. I didn’t use chocolate curls because (a) I didn’t have the equipment to make them and (b) I didn’t feel like making them. Recipe originally published in Allrecipes daily e-zine on Sunday, November 30, 2008. If you live in Chicago, you may think the date this dish was made looks familiar. It was the beginning of “snowpocalypse”. Something in my brain said, 2 feet of snow = soup for dinner. 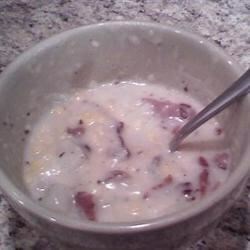 What better soup to make than a hearty potato soup? I was excited by this one because of the parmesan cheese in it. Usually, there’s a light cheddar presence or if you’re making baked potato soup, possibly an American cheese. Mostly, it is blended potatoes in a cream base. Now, I always have to remind myself that these are not professional photos for these recipes. In fact, most of the recipes are user submitted, so there isn’t much control for what the chef/photographer does with their recipe or photo. I like to use the pictures more as a frame of reference than what it “should” look like. That being said, my soup and Katy’s soup (Katy is a fellow allrecipes user and the photographer) look pretty similar, so I was confident that I was on the right track. She may have a little extra bacon in her soup, but who wouldn’t add more bacon where they could? If you’ve ever been in the Loop or walking around the River North area and suddenly smelled the sweet, sweet deliciousness of chocolate, you probably smell Blommer Chocolate. I first stumbled upon them when I lived downtown. I lived in The Loop very close to Dailey Plaza (That’s where they got that Picasso), and one day, I literally followed the smell to the candy factory. I’m a very lucky woman. My husband works downtown, and as a fitness guy, opts to walk on his lunch hour. One day he came home and said, “hey, have you ever heard of Blommer?” I immediately shrieked and said, “BUY ME SOMETHING!” Now, on occasion, he’ll bring me home a surprise. This was one of those days. Recipe originally published in Taste of Home’s daily e-zine on Thursday, August 7, 2008. With my imminent return to the working world, I’m stockpiling up on casserole dishes. I want things I can assemble and store in the fridge and then toss in the oven when I get home from work. Even better, my husband can toss them in the oven. I love lasagna, but it can be a lot of work, so I always look for similar casserole dishes that I can throw together easily. It’s a pile of food, so it’s hard to say if it looks the same or not. My casserole did brown nicely and looked fantastic on the plate. This dish’s aroma filled the house and I couldn’t stop smiling, or for that matter digging into the casserole dish every time I passed it. 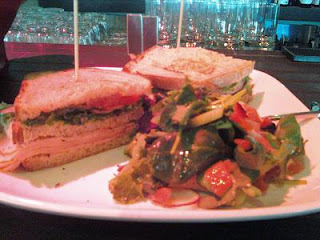 I decided that it was time to also post about some of the amazing food I have while I am out and about. At first I wasn’t going to do this at all on this blog, and then I had this lunch. My meal was so delicious; I had to take a picture. Thus this new feature will pop up every once in a while. ©You Want Me to Cook? First, I have to say that The W Hotel is gorgeous. The people are really nice there and even if you sit in their lobby, someone will come and ask you if you’d like something to drink or if you need anything. I’ve had the pleasure of staying in one of their rooms too. Absolutely beautiful. I’m not afraid to go out by myself – restaurants, travel, movies, spa, theater, etc… I was single into my 30s and if I would have stayed in every night waiting for someone to take me out, I would have never done anything! I had an appointment at Bliss Spa in the hotel (another INCREDIBLE experience) and had a lot of time to kill, so I decided to get something to eat. Recipe originally published in Every Day with Rachael Ray, February 2011. Pesto has quickly become one of my favorites. You can put it on pasta, salad… heck you can even put it on a sandwich! Traditionally, pesto is made with basil leaves, olive oil, garlic, and pine nuts/walnuts. Of course, I’ve also tried alternative pesto, including one that used asparagus and I’ve enjoyed it every single time. When I was flipping through my copy of Rachael Ray, I saw this recipe and thought it sounded delicious. Bonus points to it being a meat-free dish as well. Of course, as I was assembling the ingredients, I feared that it wouldn’t have a lot of flavor. Cashews are my favorite nut, but they don’t have the most kick and parsley – eh, not one of my favorite herbs. I decided to go ahead and make it though, although I did make it on the same day I cooked something else. Since you know how I HATE it when they don’t use the same thing, let me tell you it was my choice to use a different type of pasta. I stuck with the same kind, but used a tri-color (more on that later). Also, my tomatoes are a little more roasted, but I also did that by choice. Finally, both recipes used Parmesan, but I chose the shredded variety and I plated it with the extra on it as well. Still, it looks pretty close and I was pleased with the presentation portion. Recipe originally published in Cooking Light, January/February 2011. I try to make seafood at least once a week, if not more, but I have a slight issue. My husband and I can’t eat dinner together during the week (he doesn’t get home until 10PM), and fish doesn’t do well as leftovers. Therefore, I usually go to shrimp since it holds up well to the fridge. Of course, there are only so many ways to prepare shrimp and I try not to soak our seafood in buttery sauces (although they sure are good). So when I came across a simple tomato and bread shrimp topping, I couldn’t wait to try it. It doesn’t look too bad, although I’m wondering how they got their shrimp to look so pretty. Mine are definitely cooked and pink, but they don’t have that golden color Cooking Light’s shrimp have. Yet, I was still very excited to taste it. Oh yeah, you saw it right. THIS is Smoothie Central. You get four recipes in one post! Mostly because I figured you’d all hate getting a single smoothie recipe for four days. Don’t you agree? This also marks the first time I did not make each of the recipes. My husband blended the smoothies (and continues to make these on a daily basis) so I essentially watched and interviewed him as he was making them. Yes, even a guy who doesn’t cook can complete these recipes! Gingery Berry and Oat Smoothie recipe originally published in Real Simple, February 2011. Spiced Pumpkin Smoothie recipe originally published in Real Simple, February 2011. Banana-Cashew Smoothie recipe originally published in Real Simple, February 2011. Strawberry-Flax Smoothie recipe originally published in Real Simple, February 2011. I hate breakfast. I’ve never been a fan of breakfast food and often I wake up feeling less than stellar. For those of you who don’t know me personally, I have fibromyalgia and my pain manifests itself as migraine headaches and severe nausea – especially in the morning. My husband, who lost 130 pounds, knows that I need to fuel my body in the morning to jumpstart my metabolism. So we began searching for easy-to-make breakfasts that look yummy, appeal to what foods I do enjoy in the morning and that I can take with me on the run. Around the same time Real Simple had their smoothie issue, my husband asked me about making them for breakfast. We picked out a bunch and my husband made one each day. Recipe originally published in Pillsbury, December 2010. Not too long ago, I blogged about Tater-Topped Casserole, or as a friend asked me to re-name it, “See Ya Later, Tater Casserole.” It was a fun recipe that wasn’t necessarily the healthiest, so when a turkey version of the dish, with a Southwestern twist, came up, I couldn’t wait to try it. I know… I know… I have French fries on top of my casserole. Well that was because of a slight misplacement of my tater tots. I resorted to what I had, which was seasoned fries. But I’ll elaborate on that more in a bit. Other than that, my casserole turned out almost exact to theirs and it was delicious. I am always looking for alternatives to pasta. Don’t get me wrong, I LOVE pasta, but sometimes I just want something a little different. At first, I thought this was going to make a nice side, but figured the beans and sausage gave it a little more of a meal quality. Still, I wasn’t sure, so I made it the same day I made another dish “just in case”. What I stumbled on was a perfect casserole dish, similar to a “bowl” dish with potatoes, meat and cheese, but healthier. The dishes looked the same, although mine had a little more liquid to it. I probably could have let it cook longer, but I got impatient. Still, I think that added something to the dish. It wasn’t dry. It was more like a sauce with sausage. The taste was incredible. 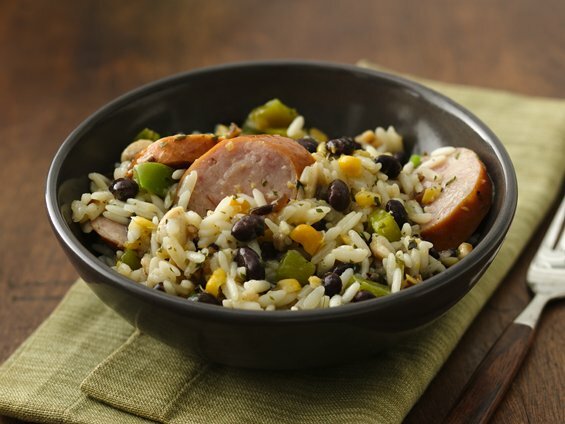 The garlic kielbasa with the beans combined well with the creamy sweet corn. Yes, we ate this as a meal, not as a side. I’m not really sure at what point in my life this happened, but I fell in love with tomato soup. It’s odd since I don’t like sliced tomatoes, and never have. However, when I’m feeling chilled and in need of comfort, nothing makes me happier than a bowl of tomato soup with a grilled cheese sandwich. This recipe was a tomato soup with pasta and beans to give it a carb- and protein-boost, not to mention the antioxidant benefits of lycopene in the tomatoes. I was game. Well my picture sucked. But getting past that… my soup doesn’t appear to be as tomato chunky as theirs. Ordinarily, I’d say that’s a good thing, but I was disappointed with that. I also selected to use small shell pasta since I had it on hand. Even so, it had a rich taste that warmed me up and put a smile on my face. Click here for the commentary free & printer friendly version of Smoky Pan-Grilled Pork Chops only. 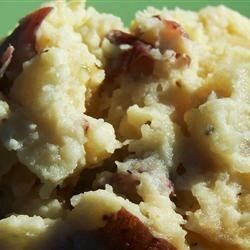 Click here for the commentary free & printer friendly version of Caramelized Onion & Horseradish Smashed Potatoes only. Smoky Pan-Grilled Pork Chops recipe originally published in Cooking Light, January/February 2011. Caramelized Onion & Horseradish Smashed Potatoes recipe originally published by allRecipes on Saturday, October 25, 2008. Simple sauces and spice rubs are an easy way to dress up chicken, beef or pork. Very similar to yesterday’s post, chicken cutlets in a creamy Dijon sauce, the pork in today’s post is dressed up with a spice rub and then grilled on the stovetop. Not bad, right? So I’m sure you noticed that Cooking Light had some side-suggestions for their pork chops. I decided I needed to find something similar to make a complete meal. But what dish to make? When I read my magazines, I type all the recipes I want to try into a spreadsheet. Then I verify I can find them all on-line at a later date. That way, I don’t have piles of magazines lying around my house – which I do anyway because I can never keep up, but that’s a story for another blog. If I see a recipe that is something similar to what I already have (and not a slimmed down version or something special) I’ll pass it up. I’m not sure why I didn’t write down what this side was, but I’m going to guess it was probably that reason. I have close to a hundred potato recipes. Now, I enjoy Cooking Light, but one of my pet peeves is that when they pair dishes together, they don’t link them on their website. You have to search through recipes for that issue, which could be over a hundred, not including the articles. So I decided to go through my pile of potato recipes instead of trying to find which potatoes they made. It was then I stumbled upon allRecipes version of Caramelized Onion & Horseradish Smashed Potatoes. Little did I know, Cooking Light had selected a similar recipe to pair with their pork chop as well. Of course, I only knew this because I was going through the comments looking for tips on keeping my pork chops juicy. NOT because they made it easy to find that information. I guess great minds think alike. Pretty nice, right? I decided to make the purchase of a grill pan since I wanted it to look pretty as well as taste good. Of course, the pan affects the cook time too, but I’m getting ahead of myself. My husband doesn’t like broccoli, so I decided to pass on this side dish, but we did enjoy a salad with it. Believe it or not, on occasion I want something easy and even boring to make for dinner. Not every day needs to be a fancy-schmancy risotto or croissants made from scratch. No, sometimes I just want a piece of chicken with a sauce and maybe a potato or salad. So when I was flipping through my January issue of Cooking Light and saw their long list of quick dinners, this one screamed out at me. I’ve made Dijon-based chicken dishes before, but this one appealed to me with the shallots (garlic-onions) so I decided to give another one a try. It certainly wasn't boring. It was absolutely delicious - yet still easy! Because this was in a quick cooking section, they didn’t have any pictures. I have to tell you I was really proud of the way this dish looked and tasted. The chicken browned beautifully and the sauce had a nice texture and a fabulous taste. The shallots and rosemary truly added something unique to the Dijon and cream base.